As summer draws to an end, we have to bid goodbye to our loyal friend, the pool. You can opt to close your pool yourself or hire a professional. They're both valid options. If you choose to DIY, though, be careful! Many pools across the country get damaged because they were improperly closed and winterized. 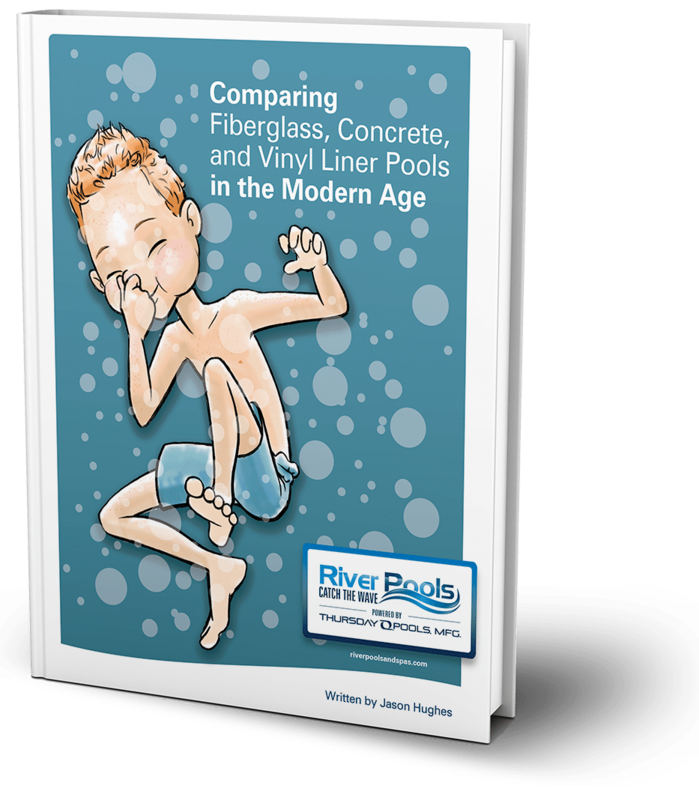 River Pools specializes in manufacturing and installing fiberglass pools, and we educate on all three pool types through our blog articles and videos. We know pools. And we're here to help you take the best possible care of the backyard oasis you've worked so hard on. What Type of Pool Needs the Least Maintenance? When I'm doing the dishes, I love the dishwasher-safe ones. I just pop 'em in the dishwasher, run the wash cycle, and move along until they're clean. So easy! Hand-wash-only dishes feel ridiculously high-maintenance in comparison. As I scrub them, I hate them. Sorry, Abraham Lincoln mug. Cleaning dishes is nothing compared to cleaning a pool. How can you make sure your pool is "dishwasher safe"—as low maintenance as it can possibly be? The TYPE of pool you have can make or break your maintenance satisfaction. The interior finish, durability, and more can significantly increase or decrease your to-do list (and your costs). In my house, we take turns doing chores, but I’m exclusively in charge of laundry. My favorite (?) part is collecting all the stained clothes so I can apply stain remover and then scrub them like an old-timey washerwoman. It feels as if I should later buy hardened brown sugar in paper bags tied with twine like I live in a Laura Ingalls Wilder book. But that’s just washing clothes. How do you feel about being an old-timey washer for your inground fiberglass pool stains? When Is It Time to Replaster Your Pool? The following is a guest post from Diane Pierce at Authentic Plaster & Tile. Owning a pool can be a relaxing way to take a break after a long day, or enjoy the majority of your summer vacation. They’re the ideal location for any backyard barbecue where friends and family can gather together, connect with each other, eat good food, and splash around. They can also be a lot of work if not properly maintained in a timely manner. The following is a guest article from Bill Michaels at Patterned Concrete. Nothing beats that “fresh, new look.” Unfortunately, too many things in life lose their luster if not properly cared for. That can be the case even for something as stable as stamped concrete, but it doesn’t have to be. Your new installation is beautiful, whether it's your patio, walkway or even indoor surface. With proper care it can keep up its appearance and luster for many years. You've invested so much into your pool. Time. Money. Sweat. Maybe even tears (although I hope not). And now some storm wants to come in and mess up your oasis? Not today, Satan! If a natural disaster is on its way, you can follow these guidelines to storm-proof your pool as much as possible. And this doesn't apply to only a hurricane or tornado per se, but any big storm, especially with high winds. When I was a kid, I hated my mom’s chore charts. I vowed, with the seriousness of any 8-year-old, that if I had children, I would never make them do that. I now make chore charts for myself. Moms really do know everything. As you plan out the swim season, it may help to make a pool chore chart for your family—or at least to mentally review what you'll need to do. When is the Best Time to Open My Swimming Pool? Well, it's that time of year again, folks. And after the winter we had here in Virginia, I say good riddance! But with the warmer weather, the ‘swimming bug' will soon be affecting all of us. (That is, if it hasn't already done so.) In fact, as I write this article and sit in my car at a parking lot in Yorktown, Virginia, the temperature outside is about 93°F degrees on April 7. Wow, now that's what I call skipping spring! The following is a guest post from Mike Harper, aka The Pool Care Guy. Flocculant may sound like the white fluffy stuff you spray on your fake tree at Christmas, but it's actually a really useful chemical you can use to clean up a cloudy pool. In fact, it's probably the fastest way to clear up a pool that you can’t seem to get clean with your filtration system. But in case that’s not enough information for you, let’s talk about it a little more.